Art Hardware in Colorado Springs had their art opening ” Winter in the Rockies” on Friday night; I have four pieces in the show, two fabric and embroidery pieces, and two winter scenes with people painted in a primitive style with a crackled texture. I was happy about selling a piece called “Shopping in the Village”, which will be sent to Hawaii as a gift to the new owner’s mother. Today I started a new marketing program that is based on the book “How To Get Clients Now”; my coach Donna Feldman from Denver is helping me with this process. The markets that I usually work in have changed so drastically so this is a good time to have a new strategy. The program consists of a system with actions that are taken on a daily and weekly basis; you have choices, for instance one of them is to follow up with two prospects everyday. This is a good thing as it helps to stay focused. The initial actions are taken for 28 days, I will keep updating my progress on a weekly basis. So far I like the concept. Early this month we had our first board meeting with the new members; I am now the vice president of the organization, and was glad to find out what my duties will be. We went over all the jobs that need attending to and I am in charge of making sure that all of the events for the year are properly in place. Next summer I am planning a plein air painting day in Garden of the Gods park, followed by a barbecue at my house. The other members are very professional and friendly, so I am happy to be a part of a good group. If you would like more information about our many events please click on the link under blogroll. My new collection of wildflower designs is finished, and is now available for licensing. The idea came to mind as I was hiking in Waldo Canyon which is a scenic trail not too far from my house; this area is covered with wildflowers around mid-summer.To see the images please post a comment on this blog. The art has a fresh flair to it and is broad in it’s market appeal. The pieces were painted in acrylic, and the accents are in oil pastels. I have typically licensed designs for baby bedding, scrap-booking products, gift bags, greeting cards and gift products. Most of my work is created with a juvenile or feminine client in mind, and has a whimsical feel to it, as does the attached logo. 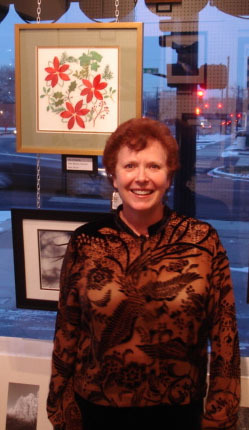 On Friday evening I attended the ArtLink show in Longmont Colorado, where I was showing four pieces of art, three acrylic paintings with pastels and one appliqué with embroidery. The attendance was very good, it was a gorgeous summer evening, which brought out a lot of families; that was a good thing as three of the paintings were juvenile pieces. Businesses and galleries participated in the event, showing a wide variety of styles and subject matter. I am leaving some of my available work at “Intuitive Office” at 357 Main Street for another three weeks. Several artists exhibited their work at the same venue, and it was fun meeting them and hearing about their careers. As it was a little far to drive home I stayed in a Bed and Breakfast, “The Thompson House Inn” which is in a beautiful Victorian House two blocks from the art event. The breakfast which was served on the patio was outstanding… great send off. This time I painted in a garden store “Pickets” in Historic Golden Colorado. I happened to be working on my wildflower series, and worked on one of the designs for several hours on Saturday. My demo was at the same time as the Golden Arts Festival, which was wonderful as it brought a lot of traffic in the store. I was happy with the response to my work, and am thinking of entering the festival next year. Creating is an act of joy. Activating the audience’s visual senses and fueling their imaginations is the reason for my studio’s existence. I strive to produce art that has lasting interest by fine tuning the nuances of color, utilizing textures and engaging the viewer with lighthearted subject matter. As a proponent of collaborative ventures I am open to commissions and new applications for my work. With an art career that spans over two decades, Beatrice Trezevant has created whimsical and colorful images in mixed media as well as appliqué and embroidery. Beatrice’s work has been licensed to manufacturers and publishers nationwide, and her designs can be seen on numerous products from scrap-booking albums to baby bedding, greeting cards, gift wrap and more. The playful style of the art lends itself well to the juvenile market, which has been the primary focus in the past few years. Mountain Moppets in Old Colorado City shows Beatrice’s acrylic paintings, and she has also recently been a part of an exhibit at the Ink Lounge Gallery in lakewood Colorado. Surtex, a design trade show in New York City and the CHA show in Anaheim have also been venues to license the juvenile images. Private collectors have also purchased paintings for children’s spaces. Beatrice studied design in Basel Switzerland, and in England, and obtained a degree in textile design from Canterbury College Of Art (LSIAD). After living in several cities, the Artist has chosen to make Colorado Springs her home. Beatrice lives and works in her Victorian bungalow, surrounded by her garden from which she draws much inspiration. This floral juvenile painting is again a combination of acrylics and pastels. I will add a couple more images and the collection will be completed. I love painting summer themes this time of year. This was the most fun I have had in a while. On Saturday thirteen of us took an overnight trek on the Colorado Trail, and took eleven llamas with us to carry our gear and French wine. The trail head was outside of Salida, where we met up with the outfitter; we started by rounding up the animals and learning how to load our tents and food. We then hit the trail, and hiked in about five miles, beautiful views, and our destination was a large meadow where we set up our camp. The rain did not dampen our enthusiasm and the wine helped a bit too. The temperature must have really dropped at night as there was frost on our tents and on the llamas in the morning. Some of the hikers in the group went another eight miles that morning and some of us went back to the original trail head. All great fun and an interesting experience.